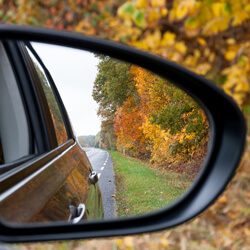 Fewer car accidents occur during the fall months—October, November, and December—than any other time of the year. Twenty-two per cent of all the car accidents disclosed by Kanetix.ca customers last year occurred during the fall. Unfortunately, the fall leads us straight into the winter season; the season when drivers are more likely to be in a collision. According to the most recent police-reported car accident statistics available through Canada's National Collision Database, collisions happen most often on a Friday. The least accident-prone day is Sunday. Additionally, the peak time of day for collisions is between 3 p.m. and 6 p.m—the evening rush hour. And, while many may assume that the morning rush hour (from 6 a.m. to 9 a.m.) is the second most common time of day for collisions, it's actually from noon until 3 p.m. Regardless of age or amount of experience behind the wheel, everyone could use a few safe driving tips now and again. No one wants to be involved in a car accident, no matter the season, day or time. If possible, avoid driving at night if you find it hard to see. If that's not feasible, give your eyes time to adjust to the darkness before driving at night, drive on well-lit roads, and avoid the glare of oncoming traffic by looking slightly to the right side of the road. Reversing out of a parking spot can be a pain. When possible, reverse park your car so you can easily exit by driving forward when you want to leave. When driving, stay focused on the task at hand; don't let your passengers, the radio, or your phone take your attention away from the road. Avoid eating behind the wheel too; it's also a distraction. Drive at a speed that is within the limit but also appropriate for the weather conditions. Maintain a safe driving distance between yourself and the vehicle ahead of you. Under normal driving conditions, safe spacing can be determined with the two-second rule—maintain a two-second interval between the time the car ahead of you passes a fixed object, and the time you reach that same object. When the weather is foul, make it a four-second interval. It doesn't matter if it's due to alcohol, drugs, or even fatigue. If you're impaired, let someone else do the driving. Has an accident put a dent in your wallet? Your driving record is one of the most influential factors in determining your insurance rate. Sure, there are others like where you live, your insurance history, and the type of car you drive, but your driving record and history is indicative of how you behave behind the wheel. Every at-fault (or partially at-fault) accident will likely increase the cost of your premiums. Keep your premiums low: drive safely, avoid tickets and shop around for your coverage to make sure your getting the best car insurance rate available. At Kanetix.ca, we shop the market to help you get the lowest rate, and our customers save an average of $750 because of it.